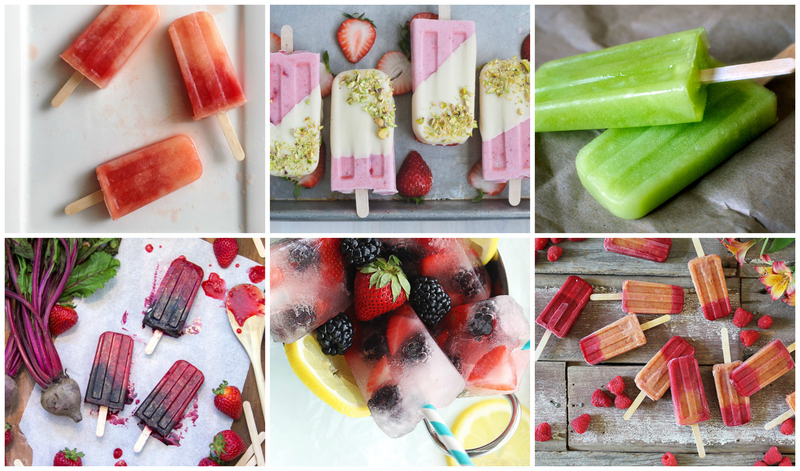 No summer is complete without having popsicles and we’ve gathered this season’s best. These pops aren’t just pretty to look at but are easy to make and delicious. Click the photos for each recipe. Recipe and photo © by McKel Hill, MS, RD LDN for Nutrition Stripped. A paleta, or Latin American fruit pop, Peach Melba pop made from fresh raspberries and peaches. Recipe and photo by Cindy Ensley for Hungry Girl Por Vida. These gorgeous strawberry cream pops only need four ingredients: strawberries, vanilla ice cream, coconut oil, and white chocolate chips! Recipe and photo by Kita for Pass the Sushi. Simple pops are refreshing. Honeydew popsicles combine fresh honeydew, lime juice, and sugar for an icy treat. Recipe and photo by Tiffany for Creme de la Crumb. These berry lemonade pops are sweet and sour, a perfect combination of lemonade and fresh fruit! Recipe and photo by Jerry James Stone for Cooking Stoned. Beet and berry pops use fresh raspberries and beets for a bold flavor. Recipe and photo by Leah Bergman for Freutcake. Watermelon rosemary lemonade popsicles are refreshing and delicious. This combination of pureed watermelon, lemon juice, and rosemary simple syrup is irresistible.